There are two ways to submit fan art to the site. The first is to email them to me at fanart@icybrian.com. The second way is to post them in the Fan Art section of the Web Forum, where you can also get feedback on them from other artists; this is preferred for artists who aren't yet posted on the site. Please bear in mind that I don't post every piece that's sent to me. I don't respond to emails containing pieces that I don't post, which is another reason why it's better to post them in the forum. A few quick notes. 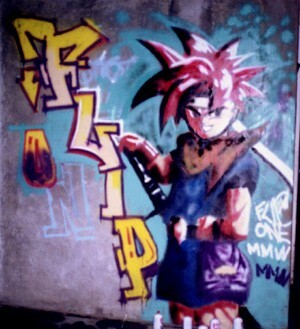 Don't just redraw the official artwork and send it in, because it's going to be rejected immediately (the only way it won't is if you do it in an original way, such as spray painting it on a wall.) Please don't send artwork drawn on lined paper or simple line drawings that have no shading or quality inking. And please, try to reduce the file size as much as possible before you submit. Artists- A list of every artist whose work can be found on this page. Contests- Lists the various fan art contests that have been held on the site. DarkRaziel - One piece of fan art. Hélène Castaing - Four pieces of fan art. Meriko Robert - Three pieces of fan art. Minako Kenshou - One piece of fan art. All artwork is copyright by its respective artist, and can not be used on another page without their direct permission; the artists' email addresses are located on their index page. This Website © Copyright 1997, Brian Work. All rights reserved. Thanks to Sax for his help with the layout. Do not take anything from my page without my consent. This site is link-free, meaning you don't need to ask me if you'd like to link to it. This site is best viewed in 1024x768.